When he returns to Texas from overseas, U.S. Marine Carter Wallace makes good on a promise. To tell a fallen soldier's wife that her husband loved her. But widowed Savannah Blackmore, pregnant and alone, shares a different story with Carter -- one that tests everything he believes. He brings Savannah back to the Triple C ranch, where family secrets -- and siblings he hadn't known about -- await him. 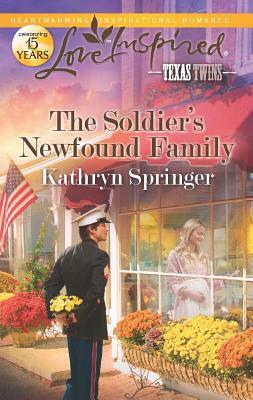 Now the marine who never needed anyone suddenly needs Savannah. Will opening his heart be the bravest thing he'll ever do? Carter Wallace, the youngest and only one who isn’t Belle’s blood, has returned from overseas. He carried a lot more than his US Marines duffel home with him, he had a load-full of guilt. Even though he may have saved three men, he wasn’t able to save his best friend, Rob. He had promised him to check on Savanna when he returned to Texas. He would do what he could to help his friend’s widow. And face all the changes in his family. A family he never felt very close to. Savanna Blackmore was in quite a situation. Widowed, being evicted and now told by her doctor that the baby she carried was fine but she needed to be off her feet more. Her only option was to take up the offer from Carter, to go stay at his sister’s ranch in Grasslands. She could get use to going from her lonely life to this boisterous family but she couldn’t intrude for long with all their own family issues going on. And if she was around Carter much longer she might fall for him. Or was it already too late for that? This has been such an exciting series. Each of the five authors so far has added so much to each of their characters and the story. I’m sure that Jillian Hart will pull it all together in Reunited for the Holidays. We have a mysterious church secretary, Bibles and apology notes popping up, missing dad, comatose mom and cute kids and critters. I would advise to start with book one in this series so you get the full picture from the beginning. It has really built up a great mystery for this last book to bring out. The main characters in this story were pretty weak. The character that fascinated me and left me curious is the church secretary (and I have some ideas on what's going on with her). I really wish she had her own story from beginning to end. I bet it would make a humdinger of a book! Unfortunately, her romance seems to be coming out over time through the six books.